Investors were caught off guard Tuesday by an explicit warning from the Federal Reserve about valuations on social media and biotechnology stocks. The Fed didn't use the "b" word (for bubble), but they implied it. After hitting a new high right out of the gate, the Dow Jones industrial average ended the day a few points above where it started. The S&P 500 fell 0.2%, and the Nasdaq, which has many tech and biotech firms among its components, lost over 0.5%. Midterm Fed report: In her semiannual report to the Senate Banking Committee, Federal Reserve Chair Janet Yellen reiterated the Fed's intention to keep interest rates at historic lows for awhile longer. The economy has improved, but the recovery is not complete, she said. "We judge that a high degree of monetary policy accommodation remains appropriate," she said. She said prices for stocks, real estate and high-grade corporate bonds remain "in line with historic norms." But valuations in some markets, such as low-rated corporate debt, "appear stretched," she added. In a written report to Congress, the Fed singled out social media and biotechnology stocks as being "substantially stretched." While concerns about valuations aren't new, investors were surprised by the Fed's focus on these so-called momentum stocks. "Clearly, investors were spooked by the Fed's decision to specify certain sectors of the equity market as being overvalued," said Dan Greenhaus, chief market strategist at BTIG. The Global X Social Media Index (SOCL), an ETF that tracks social media stocks, fell 1%. The iShares Nasdaq Biotechnology ETF (IBB) sank more than 2%. Winning tech stocks: After the market closed, Intel (INTC) reported earnings that beat expectations and announced plans to boost its share repurchase program by $20 billion. The stock is trading about 2% higher after hours. 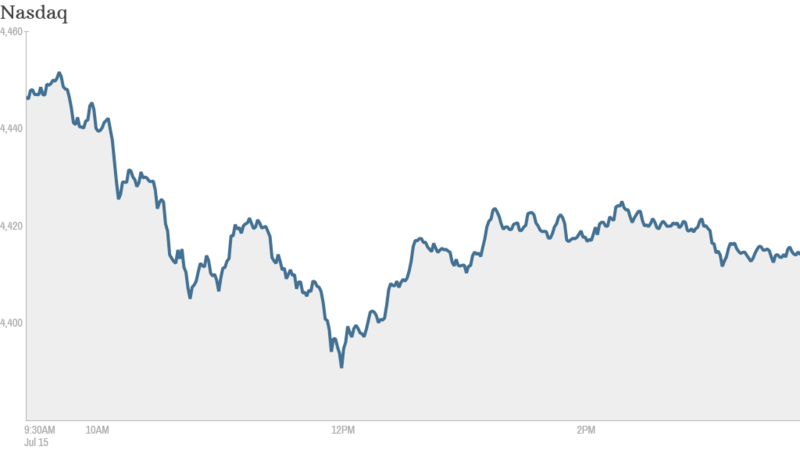 It is now the top performing stock in the Dow for the year. Shares of Yahoo (YHOO) rose 3% in extended trading after the Internet company reported better-than-expected earnings. Bank earnings: Goldman Sachs (GS) and JPMorgan (JPM) were the top gainers on the Dow after both reported quarterly earnings that beat analysts' expectations. JPmorgan stock gained 3.5%. The results came one day after Citigroup (C)reported earnings that beat expectations and announced a $7 billion settlement with the federal government over mortgages it sold in the run-up to the financial crisis. Related: JPMorgan earnings: Thanks, Main Street! Johnson & Johnson (JNJ) also reported earnings that beat expectations. The maker of consumer health care products boosted its full-year earnings forecast as well. But the stock was down more than 2%, making it the biggest drag on the Dow. In economic news, the government said retail sales increased 0.2% in June from the month before. That was a smaller gain than expected, but economist said the report showed strength below the surface. Tobacco tie up: Reynolds American (RAI) and Lorillard (LO) announced plans to merge in a cash-and-stock transaction valued at $27.4 billion. 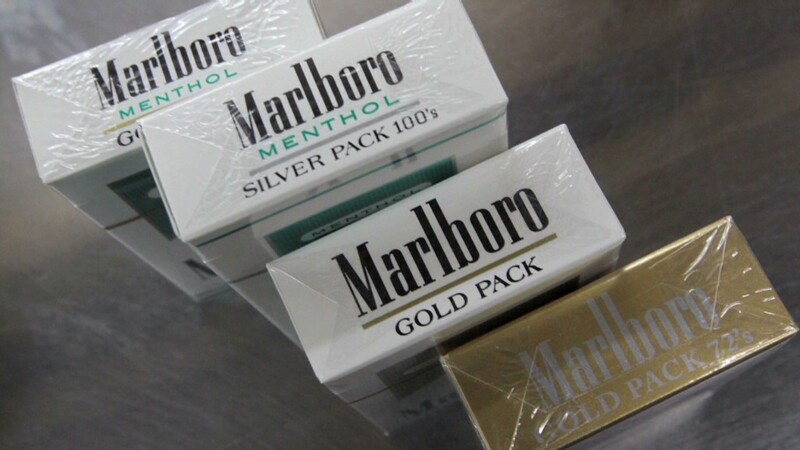 Under the terms of the deal, Reynolds will sell certain brands and assets to Imperial Tobacco, while British Tobacco will maintain its stake in Reynolds. Shares of Reynolds and Lorillard had rallied ahead of the widely-anticipated merger, but both stocks were down sharply after the news came out. Lorillard is down over 10%. Fashion faux pas: Michael Kors (KORS) stock fell on a negative analyst report. Kors is up close to 30% in the past year, but there are questions about whether the momentum can continue. Overseas markets: European markets ended lower, after Germany's ZEW index of investor sentiment came in weaker than expected. Concerns about Portugal's Banco Espirito Santo also weighed on European markets. BES shares plunged amid concerns that a company linked to the troubled bank might miss a debt payment. But the stock recovered later in the day following upbeat comments from its CEO.